PHIN Labellers is a Canadian owned and operated company, designing and manufacturing its own unique range of container decorating and security seal machines. Its origins go back to the Phin brothers, inventors of the first automatic excise tax stamp applicators for the liquor industry shortly after World War II. Over the subsequent six decades, PHIN Labellers have achieved worldwide acceptance for their successful contribution to the packaging industry. 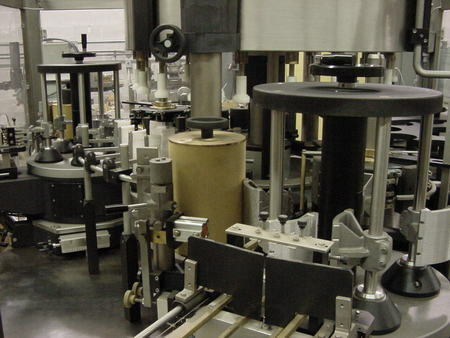 These labelling machines which won international buyer loyalty are once again being manufactured in Canada. SPS/PHIN Limited offers an "across the board" range of decorating machines for all product formats and speed ranges. The original ranges of wet-glue and pressure sensitive Labellers have been redesigned with today`s technology. Our Labellers are production ready, ensuring outstanding reliability and years of useful life. In addition our Tax Stamp, security seal, full and tamper evident sleeving equipment gives our customers many options to decorate the simple and most elaborate of containers. SPS/PHIN Limited is dedicated to meeting the industries most demanding requirement in terms of label placement accuracy, multiple label application and mixed technology systems. The company pioneered the concept of "Mix & Match" cold glue, hot melt and pressure sensitive application on the same machine frame. Many of the most prestigious and well known Label dresses in the world have been applied with PHIN equipment. Whether your looking for a simple pressure sensitive machine applying a single label, or a 1000 cpm Labeller for front, back, neck and shoulder labels, PHIN Labelling machinery will meet your design needs. SPS/PHIN`s personnel insure every customer relationship matters. We are are committed to providing superior value in our products and services. We are dedicated to achieving continuous improvements in quality, cost, delivery and responsiveness. We think our customers as partners who share our goal of making every project completely successful. SPS/PHIN Limited, the best source for single label, multiple label and wraparound equipment to suit all your applications. Contact us today at 416 298 2151, we have over sixty years of experience.